The project to build the would-be world’s tallest Ferris wheel in Staten Island was called off in October, after nearly a decade of delays and $450 million in investment. 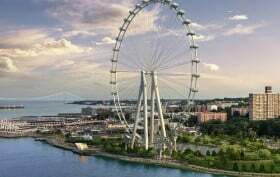 While the proposed 630-foot New York Wheel is officially dead, parts of the ill-fated attraction will go up for auction next month, the New York Post reported. Items up for sale include the wheel’s legs, valued at $9.2 million, and drive towers, for $3.3 million. Staten Island’s New York Wheel project, SIAdvance reports, is dead. Cristyne Nicholas, a spokesperson for the project, has announced that the would-be world’s tallest Ferris wheel, dreamed up to anchor the redevelopment of the borough’s North Shore, will never be a reality. “After years of planning, the developers of The New York Wheel announce, with great disappointment, that the dream of building a world class attraction in Staten Island will unfortunately not come to fruition,” Nicholas said. Construction on the privately-funded project that has been in the works for over half a decade was halted in May of 2017. $450 million had already been invested in the 630-foot Ferris wheel, which was originally scheduled to open in October of 2016. The total cost of the project was estimated at nearly $1 billion. Update 9/7/18: The de Blasio administration on Thursday said the city will not provide any funds to help finish the New York Wheel, NY1 reported. According to an official from NYCEDC, “public funds are too scarce and valuable to be leveraged for this venture.” The New York Wheel has until Sept. 11 to determine whether its project can continue. The New York Wheel, a project plagued by years of delays and legal battles, has one week to recommence construction or work on the Staten Island job will stop. In May, developers were given 120 days, by Sept. 5, to find funding and a new contractor for the 630-foot Ferris wheel. 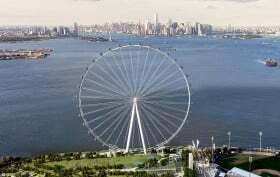 In court papers filed Tuesday, the New York Wheel asked for a one-week extension, until Sept. 11, to find ways to restart construction, Staten Island Advance reported. “[We are] committed to the completion of the project, which is the centerpiece of a Staten Island redevelopment project. This settlement will allow New York Wheel the opportunity to finalize its financing arrangements and re-commence the construction and completion of the Wheel,” the New York Wheel said in a statement responding to a bankruptcy court stipulation that gives the project 120 days to find the required funds and hire a new contractor (h/t SI Advance). This comes after the project’s design team walked off the job last June amidst a “bitter pay dispute” with the developer. The 630-foot Ferris wheel has been plagued by cost overruns and delays from the beginning, so if they’re not able to get things back on track by September 5th, it could mean the end of what was planned to be a major revenue generator and attraction for Staten Island. The New York Wheel, Staten Island’s under-construction 630-foot Ferris wheel, has been plagued with cost overruns (it’s gone from a $230 to $590 million project), delays, and skepticism from the beginning, and it appears that these missteps have finally come to a head. The Post reports that the project’s design team, European company Mammoet-Starneth who was also responsible for the London Eye, walked off the job in late May and threatened to terminate their contract after they “got into a bitter pay dispute with the developer.” The New York Wheel LLC then filed a federal suit claiming that halting work was putting the borough’s waterfront revitalization at stake and that Mammoet is responsible for “extortionate” billing, “defective” equipment, and shoddy, dangerous construction. In early October, the New York Wheel welcomed its four massive legs at the South Brooklyn Marine Terminal in Sunset Park—the first physical components of the project to find their way to NYC. Now another milestone has been met, as Friday marked the first delivery of parts to the official Staten Island construction site. According a press release, two of the wheel’s four pedestals have been unloaded, and another two will arrive later this week. Despite its opening being pushed to April 2018, the New York Wheel is marking a major milestone–the arrival of its first physical components. According to a press release, the Staten Island Ferris wheel’s four legs arrive today to the South Brooklyn Marine Terminal (SBMT). 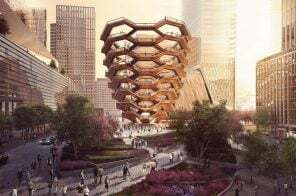 When complete, the 60-story, 630-foot wheel will be the world’s tallest, so it makes sense that each leg weighs in at a whopping 500 tons and measures 18 feet wide and 275 feet tall. POLL: Will the New York Wheel Revitalize Staten Island? Though the New York Wheel got its first shipment of crane parts last month, its opening has been pushed back from late 2017 to April of 2018, reports DNAinfo. Construction on the $580 million Staten Island Ferris wheel is still on track to finish up next year, at which time it will resemble the renderings, but “the wheel requires rigorous testing and commissioning that must be conducted to the highest standards,” said its CEO Rich Marin. 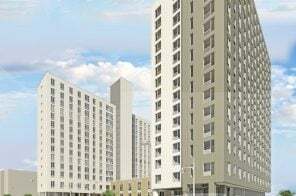 This is not the first time the project has been delayed, and it’s also been plagued by financial issues (it went $300 million over budget) and legal battles, but the developers are still optimistic. 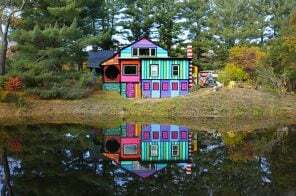 In fact, they’re projecting that the attraction will be more lucrative than the Empire State Building’s observation deck and bring in more than four million visitors during its first year. But is a giant Ferris wheel enough to revitalize an entire borough, especially the one that’s for so many years been the black sheep of NYC? 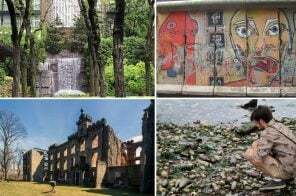 Sunset Park was recently named one of the 15 coolest neighborhoods in the country, due in large part to the burgeoning success of Industry City and the Bush Terminal Park. And in addition to its booming creative sector, the ‘hood can now include a revival of its shipping industry on its growing list of assets. 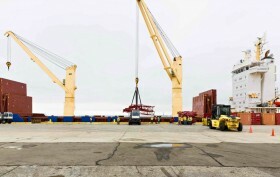 As DNAinfo reports, on June 28th a cargo ship from Denmark carrying large crane parts for construction of Staten Island’s New York Wheel arrived at the South Brooklyn Marine Terminal (SBMT), where it was docked for five days with around 30 union longshoreman moving the cargo. 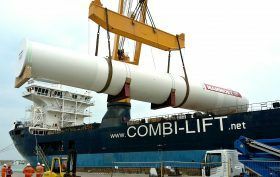 This was the first shipment to the site in more than 10 years, revitalizing it as “a working maritime port facility” that will hopefully create hundreds of jobs. Despite controversy, several delays, and a $30 million crowdfunding attempt, the New York Wheel is projecting major first-year revenue. According to The Real Deal, developers of the 630-foot Staten Island ferris wheel expect to bring in a staggering $127.85 million in 2017, a figure that will make it more lucrative than the Empire State Building’s observation deck, which raked in $111.5 million last year. Of the total revenue, $96 million is projected to come from admission fees (which come in at $35 a person, as compared to the Empire State Building’s $32); $10 million from sponsorships; and $8.7 million from gift shop sales. And if you’re impressed by these numbers, annual revenue will likely grow to $166.52 million by 2021!